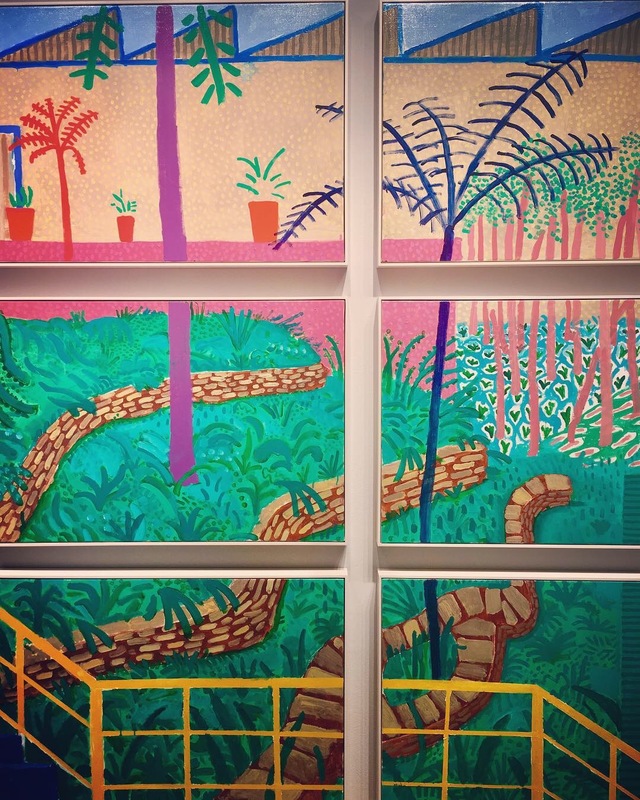 Blogtown: New David Hockney & Alison Saar Works At L.A. Louver! 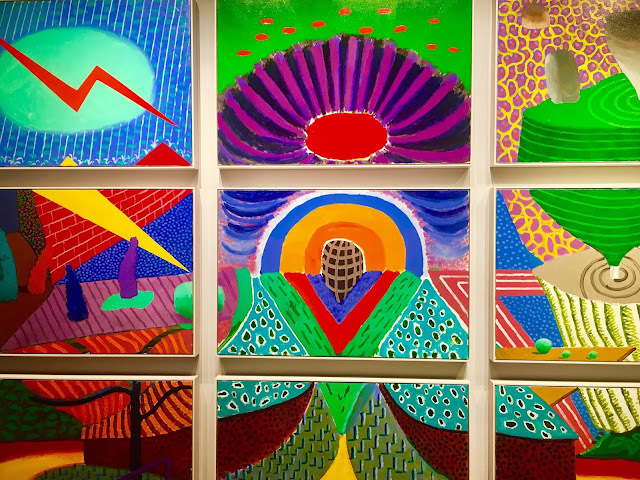 New David Hockney & Alison Saar Works At L.A. Louver! There was a packed house at the L.A. Louver last night for the opening of David Hockney: Something New In Painting (and Photography) [And even Printing] ... Continued as well as a new sculpture from Alison Saar almost exactly a year after their dual show this time last year. 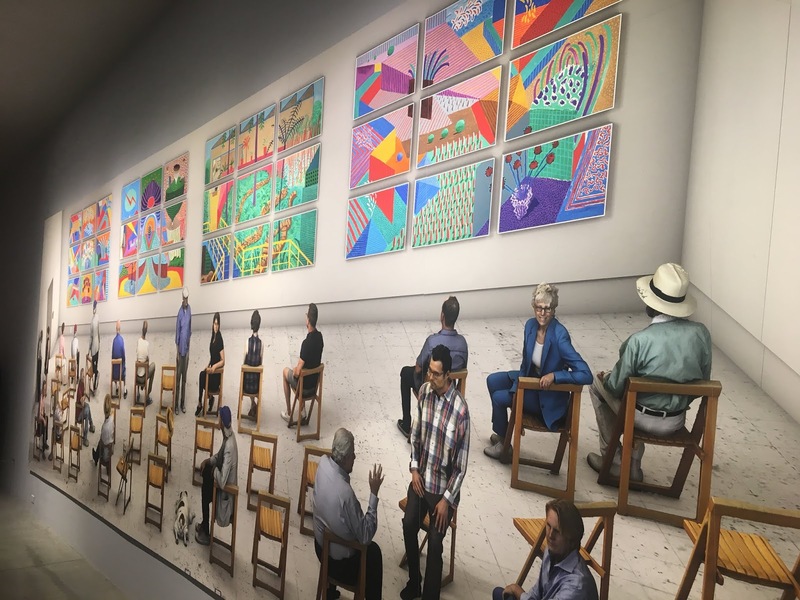 The crowd was abuzz with anticipation to see the new work from one of the most celebrated living artists in the world, but certainly in Los Angeles, which is almost always the star of Hockney's work. Bright colors and swimming pools made his name, and we were all here to see the latest. It was almost intimidating to arrive to see the absolute longest line to get in I've ever seen stretching down Venice Boulevard all the way to Speedway. Indeed, it was too much for some who chose to sit it out at James Beach or the Canal Club rather than wait in line, but that's too bad because the line moved very quickly, and the reward was great once inside the door of the Louver. The first floor was all Hockney, with large scale murals depicting "photographic drawings" of people in chairs taking in the more familiar, colorful works from Hockney. The drawings of mostly men were a little creepy to me, but it's cool to see such a range from someone so known for the almost tropical hues of his beautiful paintings of the great and sunny outdoors. 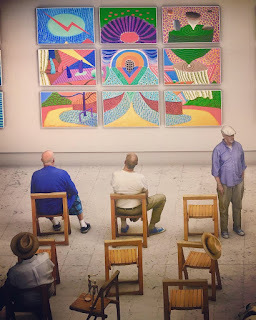 I've loved the Australian artist, Ken Done, since I was a little kid, and several of the bright new works from Hockney reminded me of those gorgeous visuals from the hemisphere to our south. 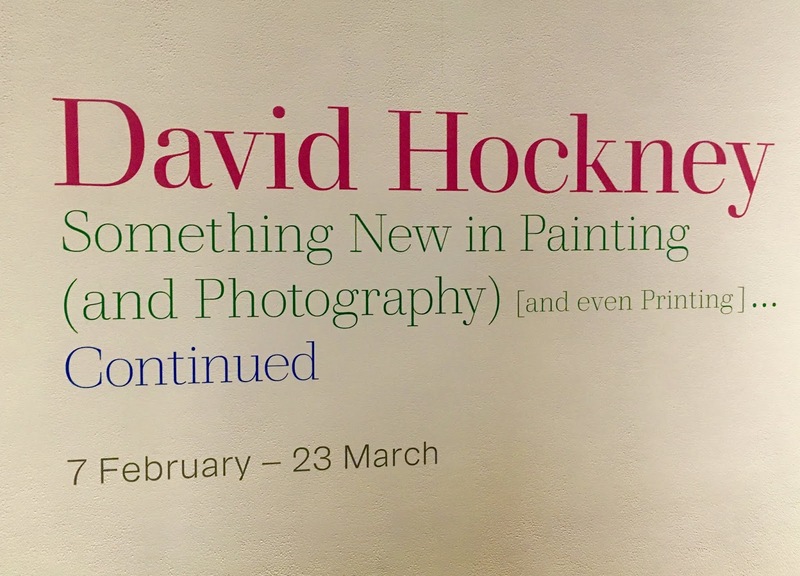 This will be a show worth revisiting, as there was really no way to take it all in with so many people crammed in there to see and be on the Art Scene. 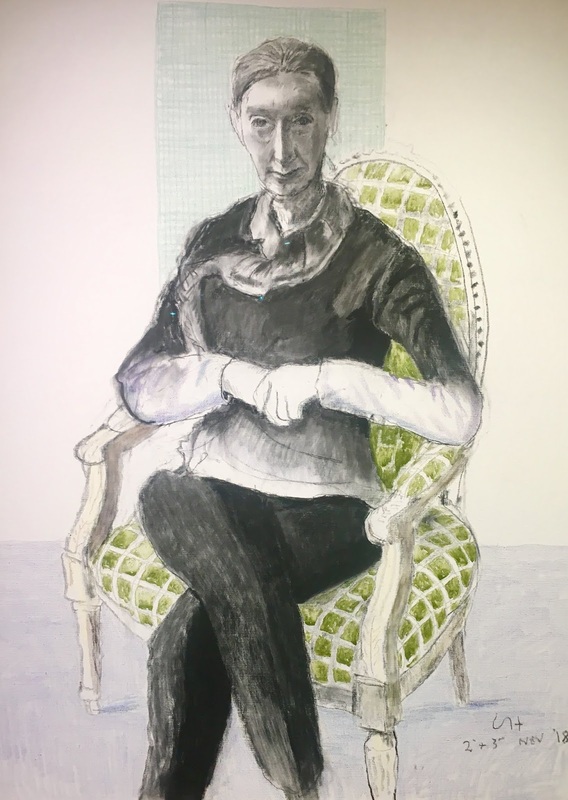 You couldn't take two steps without running into a longtime Venetian art lover, and that's really the best part of these show openings. That, and the confirmation that ART is still very much alive and well in our fair town. 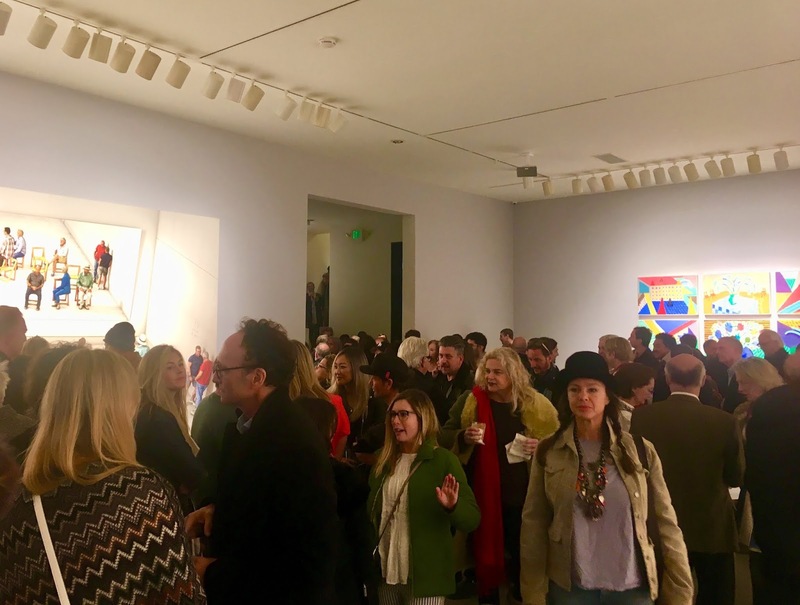 I overheard a girl in line saying in her Millennial drawl, "It's smart that they're putting art galleries in Venice now, there's so much money here." I had to step in and let her know that this venerable gallery has been here in Venice since 1975 ... and that Venice has always been about art, money or none. And always will be, if we the People have anything to say about it. And we do. The upstairs gallery featured more of the bright works, and a series of drawings of Hockney friends, from Ed Sheeran to this lady that I thought was Jane Goodall, but was really a woman called Erica Bolton. I loved the piece called The Walk To The Studio, 2018, as it features the wonderful flora and fauna outside of Hockney's Hollywood Hills studio. Lucky fella! 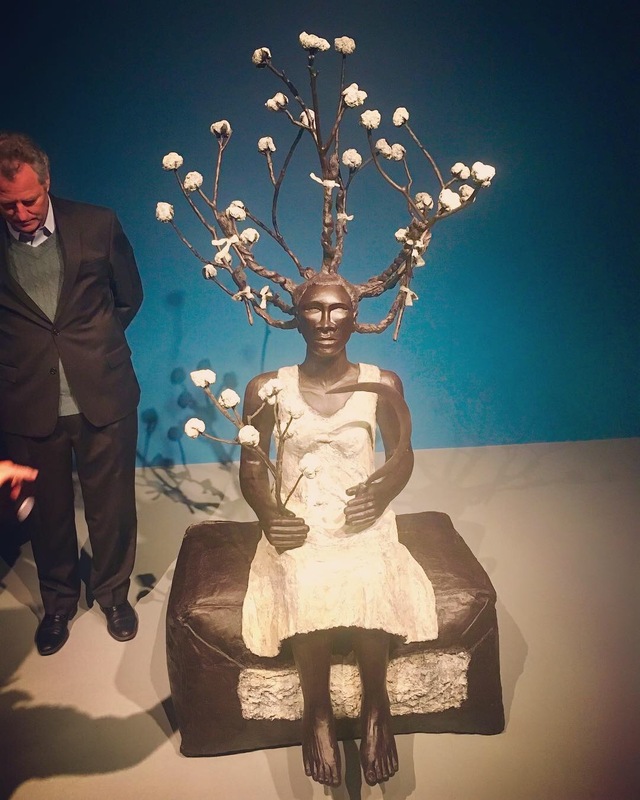 In the Skyroom outdoor galley, there was the new sculpture from Alison Saar called Grow'd, depicting one of her Topsy characters based on the girl in Uncle Tom's Cabin. It is pure power, and the now grown girl/woman commanded the room beautifully. 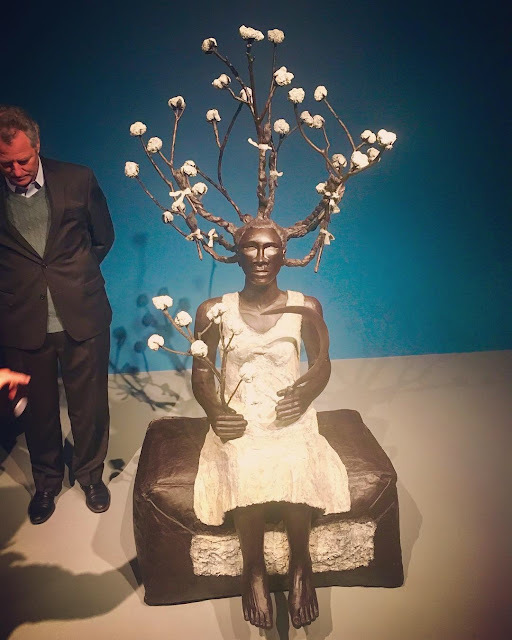 I love Saar's work, and I'm not alone, because there was a hushed and reverent aura over the room from everyone who entered. The importance of good art cannot be understated. What a great show! And night - as the party continued on to James Beach, the Venice Art Crawl mixer at Canal Club, and then an extra fun whiskey tasting party over at The Stronghold. 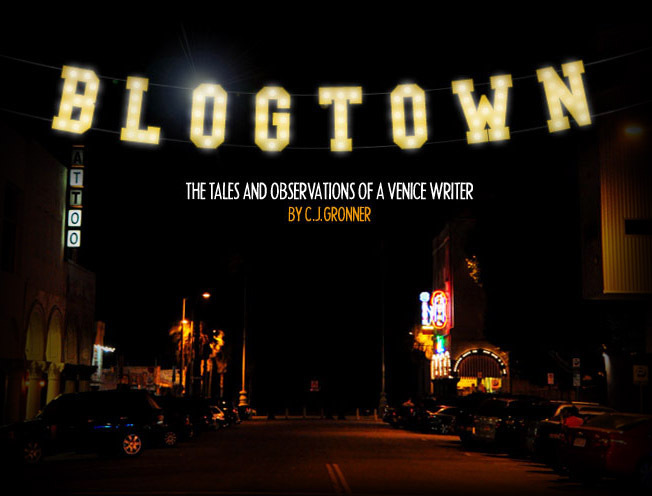 This was one of those Venice nights that make all the rest of the things going on here all the way worth it. 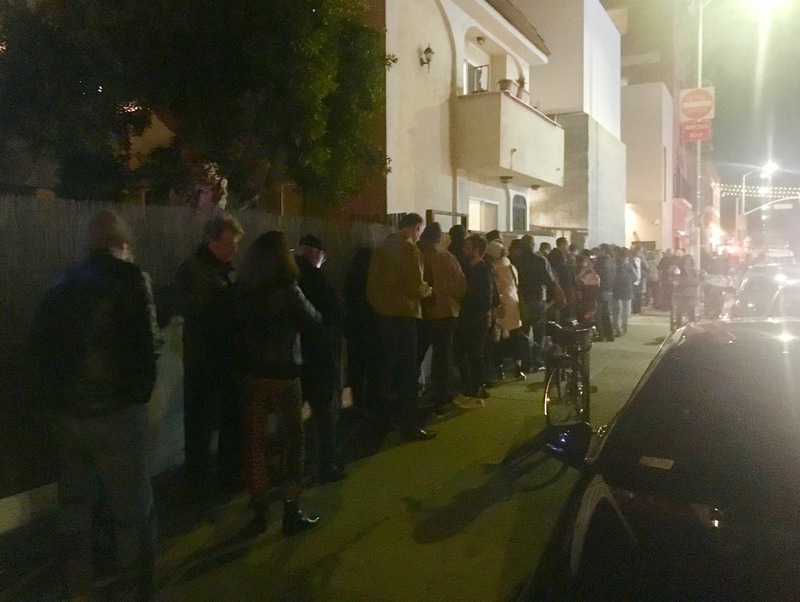 Kind of like standing in the line to get into this show ... there's hassles, sure ... but the art and community you get once you're here is WHY you're here. I love you, Venice. I love you, Art. Thank you!